Since our commencement, we are immersed in providing an elite array of Power Transmission and Distribution Service. Being a quality oriented organization, we are involved in providing Power Transmission Service. MBH is a leading EPC contractor for transmission projects and have completed many challenging projects in India, Nigeria and Ghana. Listed below are few of the projects completed as well as ongoing. Clients can purchase Transmission Line Tower (132 KV) from us. 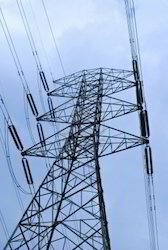 We are a prominent Transmission Line Tower Manufacturer, Exporter and Supplier in Haryana (India). The Transmission Line Tower that we provide is fabricated with industry grade angles and channels. The production as well as the galvanization of Transmission Line Tower is done in compliance with the IS standards. Despite the breathtaking strides in industrialization made by India in the recent decades, we have not been able to meet the concomitantly rising demand for electricity. - We provide Power Transmission services within the central grid for power transmission in the subcontinent region, including transformer stations, cables and lines with higher voltages. Services include Transmission Line Planning, Routing, Surveying, Designing, BOM, Maintenance and Contingency services. - Power Transformer, Electrical Protection Relays, SCADA System, PLCC System, Control Panels, Switch Yard & Tower Fabrication, H.T. & E.H.T. Insulator, Bushings. - All Type of Conductors, Earth wire & Cables for H.T. & E.H.T. Lines and Sub Stations. Power Transmission Projects - Power Transmission Services, Electric Power Transmission Projects And Electric Power Transmission Services. Unitech Power Transmission Ltd. is a company built on strong foundations of experience, expertise and technological insight.